Packing the right clothes for Hawaii can be tough. Really tough. And I certainly know. I can’t even count how many times I’ve thought “I shouldn’t have brought this…I didn’t even wear it.” If this sounds like you, read on. I’ve had so much practice flying back to Hawaii that I now have an essential list of must-have clothes for Hawaii. Where you’re coming from (or what you’re acclimated to). Which island(s) you’ll be visiting. Which season you’ll be traveling in (believe it or not, it’s true!). The key is comfort. You’ll be doing a lot of exploring so the last thing you want is worrying about adjusting your top, the rash from your board shorts or your hat flying off at Pali Lookout. Local Tip: Bring a rashguard! 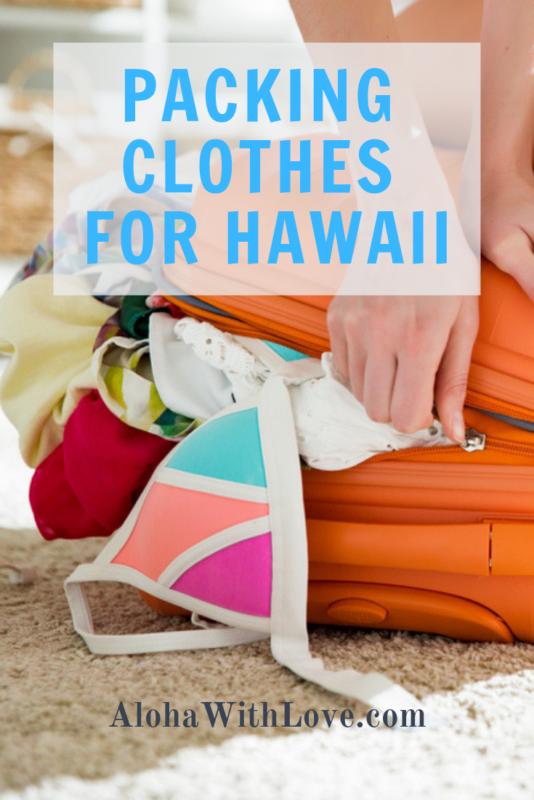 This post is all about what kind of clothes you might need to bring to Hawaii. But if you’re looking for a packing list, head on over to Melissa’s post from The Family Voyage. She has an excellent minimalist packing list for female travelers. Packing Clothes For Hawaii? Keep It Light, Keep It Simple. MOST of Hawaii is a tropical island. So think cotton, light and breathable. Luckily, cotton, light and breathable all tend to be lightweight and/or thin material, which is great news for your suitcase. The most common activities on the tropical side of Hawaii are going to the beach, hiking (desert, humid rainforest, muddy waterfalls), circle-island driving, and relaxed dining. Your clothes for Hawaii will depend on which activities you choose to do, so try to have your itinerary set so you can pack accordingly. The other extreme climate in Hawaii is similar to deserts. On the Big Island, the Hawaii Volcanoes National Park (Kona) is a hot and dry lava field that despite their beauty, will make you feel like you’re baking in a hot oven. On the other end of that spectrum, there is also snow on the Big Island’s Mauna Kea and Mauna Loa and the temperature can go below zero degrees even during the summer (did I mention that snow can still fall during the summer, too? It happens). Maui also requires warm clothing if you intend to head up to Haleakala to catch a glimpse of the sunrise. 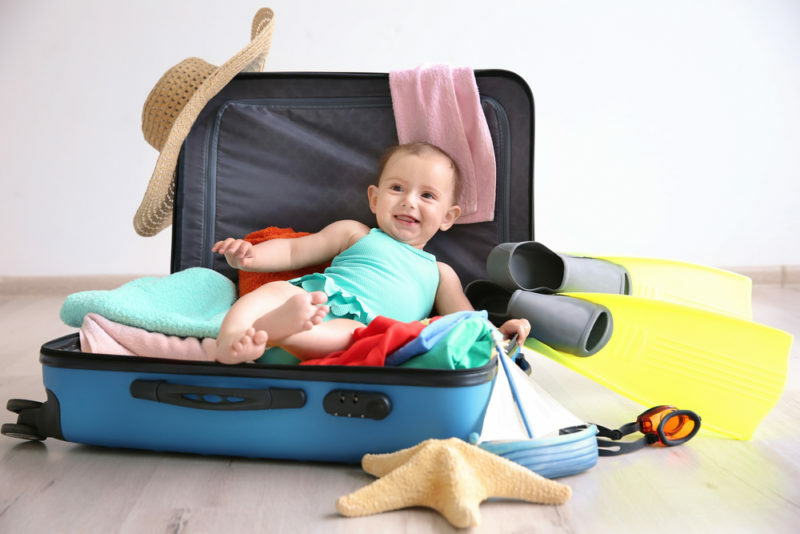 In other words, by planning ahead and setting your everyday itinerary, you’ll conserve that space in your luggage and choose the correct clothes for Hawaii. How often and how long will you go to the beach? Everyday? Once? Morning dip? For hours and hours? 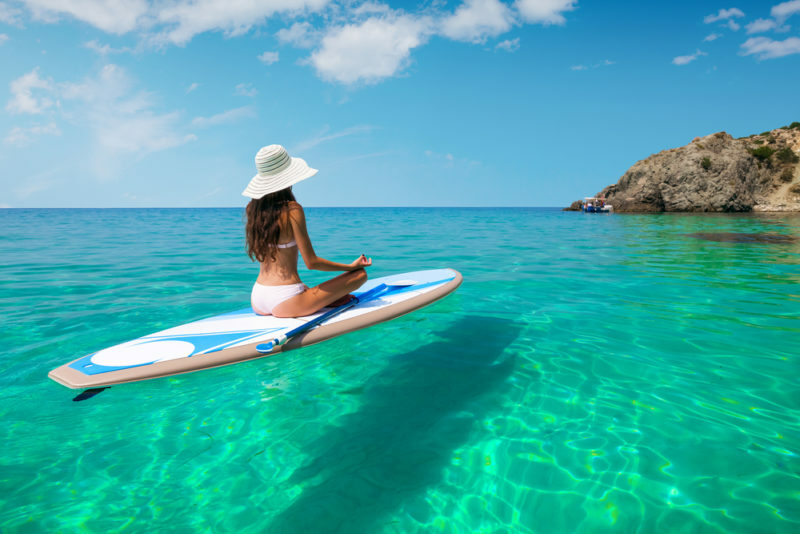 What do you plan to do at the beach: Snorkel, float in the waves for hours, kayak, fish, suntan, sit under an umbrella, SUP? Do you burn easily? Women: Are you comfortable using your swimsuit as underwear? Men: Are you comfortable using your board shorts as regular shorts? How often will you go to the beach? Everyday? Once? Morning dip? For hours and hours? This will be the deciding factor for bringing 1 or 2 swimsuits. For those planning to stay at the beach all day everyday, bringing 2 sets is essential. The first pair may not dry fast enough and it you’re working on that tan, two swimsuits will get you a more even tone. But if you only plan on jumping in for some recreational swimming each morning or to work on your tan, then you can probably get away with just the one set. For men, this is even more important. Speedos are quick to dry, but board shorts (especially those with that extra lining) can take forever and a day to dry. For guys who plan on using their board shorts as regular clothes, you may even consider bringing 3 pairs since it’s common to see locals wearing board shorts on a regular basis (i.e. my brother wears them ALL THE TIME). If your Airbnb has a dryer, then you don’t have to worry about bringing extra swimsuits, but many hotels have pay-to-play dryers which is a hassle since the dryers are usually on a totally different floor. Figure out when and what facilities you’ll have access to beforehand so you don’t have any surprises. Snorkeling, kayaking and SUP can be grueling on your skin. Direct sunlight will hit your exposed skin and whether or not you’ve applied sunscreen, it will burn your skin and make you become a peeling mess if you’re under those rays long enough. Consider investing in a rashguard in order to protect yourself. They are lightweight and made to wear in the ocean or pool. Plus, they’re really great for those hikes as well! Rashguards collect those irritating sweat droplets and don’t make you feel like your clothes are weighing you down. 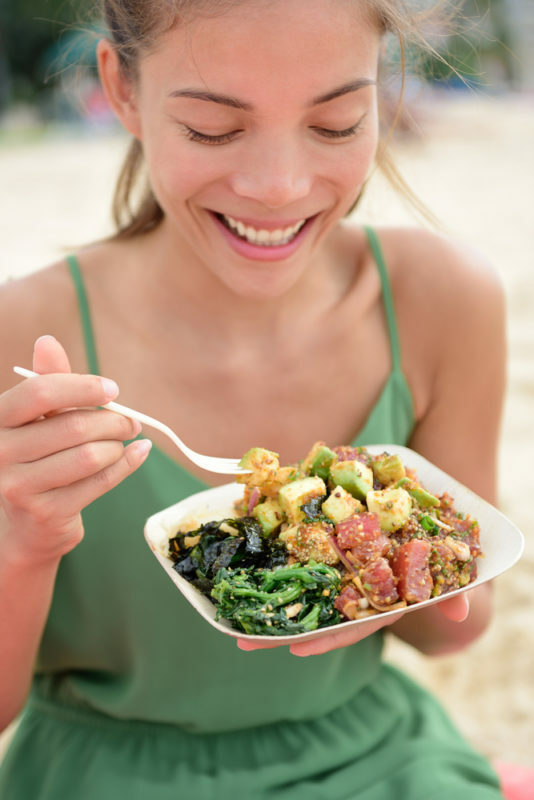 Beach, hiking, relaxing…it’s totally normal to wear your bikini underneath – what better way to have fun in Hawaii than with unplanned beach dips? Especially when it gets humid, you’ll find yourself wanting to shower or change clothes in the middle of the day. Wearing a swimsuit underneath will keep your real underwear clean for another precious day. Men can also use their board shorts as regular shorts as well. The only thing I would caution against is to make sure your shorts don’t chafe when wet. A lot of board shorts will rub a bit too intimately if you jump in the ocean and decide to go on a nearby hike right after. This also goes for those waterfall hikes, too. Hiking is another popular activity on Hawaii and most visitors will try to fit 1 or 2 into their schedule. 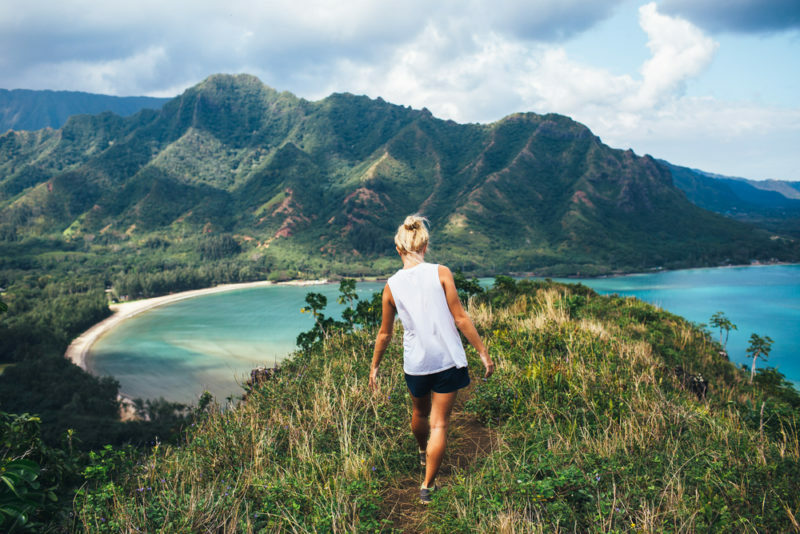 In general, there are 3 types of hikes on the islands and you should know which hikes you’ll be going on so that you can bring the proper clothes for Hawaii. Hikes such as Diamond Head or Kaena Point are usually hot. The sun beats down and the best time to hike is usually in the morning during cooler hours. The best hiking clothes for Hawaii are light, breathable and won’t stick to your sweaty skin. If you burn easily, then that rashguard I mentioned earlier is great to wear under your shirt. Or, if you have a compression shirt hiding in your closet, that will also work. In general, your clothes for Hawaii should be light colors such as white or light grey. Otherwise, you’ll feel the burn as you climb higher toward the sun. Many people wear a hat to these burning hikes for good reason. Suffering with painful skin for the remainder of your Hawaii vacation (or worse, on the plane ride back!) is not anybody’s idea of fun. However, check to see if the hike you’ll be going on is windy. If it is, hold on to your hat or make sure it is somehow secured to your head. Once your hat goes flying off the top of the mountain, consider it gone. Muddy Hawaii hikes are all over the islands. Our hikes usually go up or through rainforests so more likely than not you’ll be stomping on mud at some point (or having some flung at you). Plus, rainforests are the perfect place for slippery moss to grow on rocks so watch out for those as well. If possible, bring pre-stained muddy hiking clothes for Hawaii. You can pretty much assume they’ll get dirty. FYI, if you get some of Hawaii’s famous “red dirt” on you, you’ve got a souvenir for life. Local tip: Humid rainforest hikes are usually loaded with mosquitos. Make sure you spray that bug repellent on before you begin your hike. The expectation on these hikes is that you’ll be getting wet. Whether from rain, a dip in a secret beach or under a waterfall, expect to be walking back to your car in wet clothes. Keep in mind that walking for a couple hours in wet clothes can be an uncomfortable or even painful experience. If you’re not wearing light, quick-drying clothes, the material will stick to your skin and restrict your movement. If you walk long enough, your clothes can rub your skin raw near your underarms or between your thighs – not a pleasant experience. Board shorts are notorious for this. You’ll probably sweat more in Hawaii so make sure all of your clothes for Hawaii are on the softer side. Sweat, rain, waterfall mist and even ocean sprays can make your clothes moist and uncomfortable to wear. Local Tip: Leptospirosis is a bacterial disease that you can get from swimming in Hawaii’s fresh water pools with an open wound. Be careful! Restaurant Wear - Fancy Or Casual? Hawaii is pretty casual when it comes to dining. Unless you plan on eating at a fine-dining restaurant that has a dress code, you won’t have to worry too much about what you’re wearing. Local cheap eats, fast food, family restaurants and restaurants that have many tourists or customers coming from the beach are often fine with slippers (flip flops), shorts and a t-shirt. I’ve even called a Waikiki steakhouse about their dress code and was told tourists with slippers come in all the time (thus I wore slippers, too!). Many couples like to visit at least one fancy restaurant during their vacation. A nice shirt, slacks and shoes are fine for guys. This may even be the time to get an aloha shirt, which can be worn at any occasion. 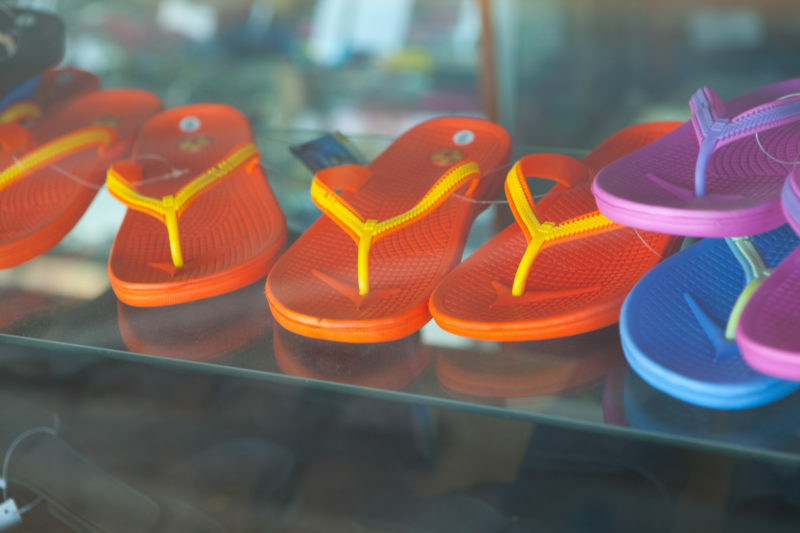 Women have even more leeway – any nice blouse, dress, pants or even shorts are OK. As for shoes, it’s completely acceptable to wear fancy slippers – you’re in Hawaii! A lot of shopping in Hawaii is done outdoors. 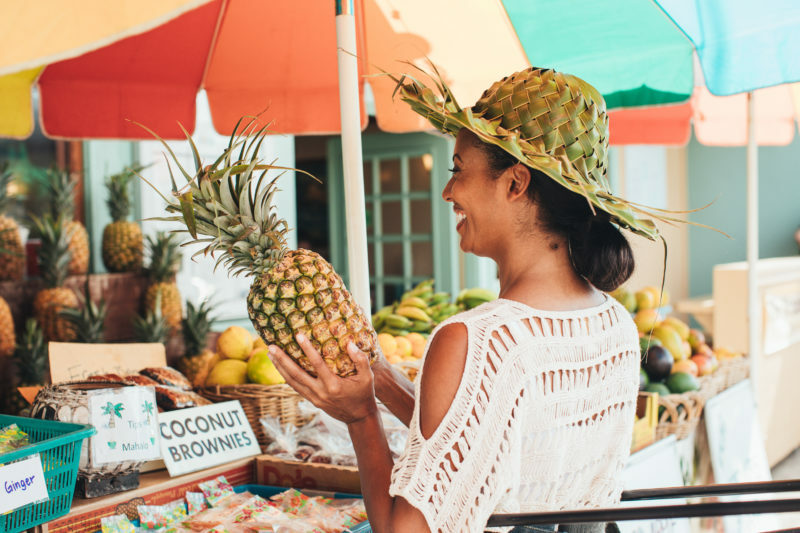 Many of our shopping malls use Hawaii’s tropical weather to its advantage so you’ll find yourself walking outside in warm weather more often than not while shopping. We also have swap meets, farmers’ markets and boutique shops, which are also outside in our awesome weather. Wear clothes that are breathable so that you get our tradewinds blowing at you. However, if you know you’ll be walking around in the afternoon sun for a long period of time (i.e. swap meets), pick out clothes that will block the sun from burning your skin. For bottoms, most people stick with shorts (jeans, khaki, etc. ), which is a great idea during warmer months since there are many days where the humidity can be a killer. But make sure to pack some long pants or capris if you’re going to be in Hawaii from November thru February. It gets chillier during these winter months and you’ll be glad you’re wearing them. Visit a Goodwill Store or Salvation Army in Hawaii and donate it back after you use it. Visit a Goodwill Store, Salvation Army or other cheap store near you before your trip to Hawaii. Donate it back before your return trip home. There are plenty of Ross Dress for Less stores in Hawaii. You know what to do. Visit these cold places on a paid tour where they supply the winter clothing for you. Should you bring a light jacket to Hawaii? In my opinion, yes. Nights in Hawaii are not as warm as you think. While we do have humid and balmy tropical nights, these are usually April thru August. Also, if you’re staying in an area with a higher elevation, a light jacket will come in handy especially if you’re taking an evening stroll. Long rides in The Bus. It’s common local knowledge that The Bus is always freezing. If you plan on doing a self-circle island tour, that jacket will be a necessity. Night strolls during the months of November thru February. Indoor shopping malls, buildings, museums, restaurants that love to blast the AC. Hawaii has a tendency to keep the inside of their buildings cold. Visitors staying in Hawaii for a long vacation should also bring a light jacket even if they are “used to the cold” back home. Your body will eventually acclimate and you’ll soon find yourself saying “it’s cold” in Hawaii like the rest of us. Shoes are one of the hardest things to pack for Hawaii – not just because there are different types for different occasions, but also because they take up so much space in that suitcase! Here’s my list of which footwear you’ll need to pack and why you’ll need it. It will be up to you to choose wisely! Comfortable rubber slippers: If possible, buy these in advance because as soon as you arrive at your hotel, condo or Airbnb, you’ll be slipping these guys on and walking around. Make sure they are thick enough so that you don’t hurt your heels from the hard ground. You’ll also want to break them in if they’re new – if you aren’t used to wearing slippers, they can sometimes rub your skin raw where the straps are. Fancy slippers or flat sandals: If you plan on eating someplace fancy or hitting a club, you may want to bring these instead of the rubber slippers. Not only can you use these for a night out, but they are also perfect for shopping, the beach and strolls. Remember, just make sure they’re comfortable for long periods of time to keep your feet pain-free. High heels and stilettos: Not really recommended since these take up a lot of space in the suitcase. You might be thinking that you’ll wear these for a night out on the town, fancy dinner or even a wedding, but fancy slippers or flat sandals can certainly work, too. Comfortable slip-ons for walking on flat surfaces: If the only hiking you’ll be doing is shopping, then slip-ons for walking are great! They’re comfortable, perfect for casual and fancy occasions, and take up less space than those bulkier athletic shoes. Just bring a pair of simple slippers and you’ll be set! Normal athletic shoes: If you’re going on a hot and dry hike during your stay in Hawaii, then go with these shoes instead. Most hot and dry hikes have rocks and slip-ons do not do great on rocks (it is easy to roll your ankle and injure yourself). Dirty athletic shoes or hiking boots: If you plan on going on a muddy waterfall hike or any other type of long and extreme hike, then you’re probably experienced enough to know which shoes you’ll need to bring with you. You’ll need to bring footwear that you aren’t afraid of getting dirty and it needs to have excellent grip. Mud and moss are not your friends on these hikes as wearing the wrong footwear can get you hurt. Dress shoes: This isn’t really recommended since these shoes are so bulky, but may be unavoidable if you are coming to Hawaii to attend a wedding. It might be worth it to suggest a real beach wedding to the lucky couple where only slippers (and aloha wear) are allowed!